"THE RENAISSANCE OF CAST IRON COOKING"
Drinking water instead of sugary pop or juice; walking or biking instead of paying hefty gym fees; playing board and card games rather than the digital versions. Many things prove that the adage ‘everything old is new again’ is true, often while improved versions of old products and thoughts are gaining popularity. Cooking with cast iron cookware is experiencing a resurgence of popularity and new devotees, like Londoner Julia Wooster, couldn’t be happier. Concerned about the possible negative health effects of cooking with artificially coated pots and pans, Wooster set out to learn how to use this green option to its max and signed up for a cooking class at Jill’s Table. “That first class was full but I was determined, so I was at my computer at 6 a.m. to sign up for the next one,” she laughs. Since then she’s built on her collection of cast iron from the frying pan that she received as part of the class and now has seven pieces that she and husband Peter use to cook almost everything they consume. "I've never had any luck with omelets," explains Wooster, admitting that others find that cast iron works well in creating this delicate egg dishes. She's had great luck cooking delicious dishes like zucchini cheddar pancakes and corn and clam fritters. (See our Facebook page for recipes.) Wooster loves to experiment with new dishes and peruses the internet to get new ideas for ways to use her favourite cookware. Jill Wilcox says that the cast iron cooking classes have proven popular so she’s adding more this fall and winter. “There has been a real uptick the last two years. People like that you can cook on all types of surfaces: gas, induction, the barbecue and even a campfire. It’s extremely affordable and reasonably easy to take care of. It can be passed down so it becomes a family heirloom,” explains Wilcox. One of her favourite dishes to prepare using her favourite piece of cast iron cookware – a 10 1/4-inch skillet – is steak. “It does a lovely job of browning the meat; you don’t have to go outside to barbecue in the winter when you cook steak this way,” says Wilcox. She also likes to bake desserts using cast iron cookware, listing upside down pear cake and tarte Tatin (See recipes on our Facebook page.) as two of the best. At Cooking Matters, Suki KaurCosier also offers cast iron cooking classes showing students how to bake in it constructing a blackberry cobbler and how to use it for cooking, preparing French onion chicken. 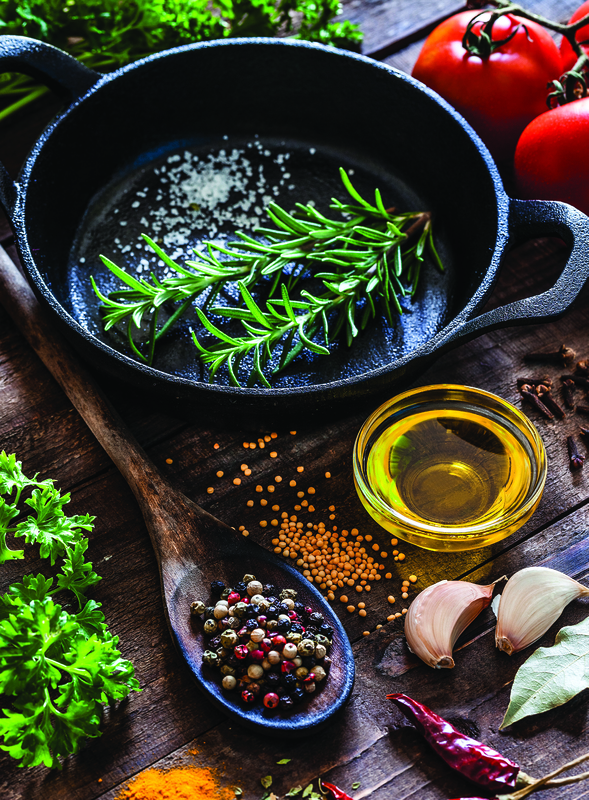 Wilcox and Kaur-Cosier agree that the most frequent questions they get is about caring for cast iron cookware because some think it will be challenging to clean something that is allergic to water. After cooking, hand rinse your pot; use salt or a bristle brush to scour out any bits left on the pan’s surface; dry thoroughly with a paper towel; rub with a light layer of cooking oil and store in a dry location. Moisture is cast iron’s enemy. Pieces of cast iron cookware can be re-seasoned by applying a thin coat of vegetable oil and baking in an oven at 350F for an hour. The good environmental and economic aspects of using cookware that doesn’t wear out, as well as its ability to be used on all surfaces to produce delicious dishes, are why Wooster is a big fan. The only drawback that all three of these cast iron devotees have experienced is that it can be heavy to use and they caution those with weak or injured wrists to be cautious. Landfills and taste buds alike will thank you for cooking like our grandmothers did.